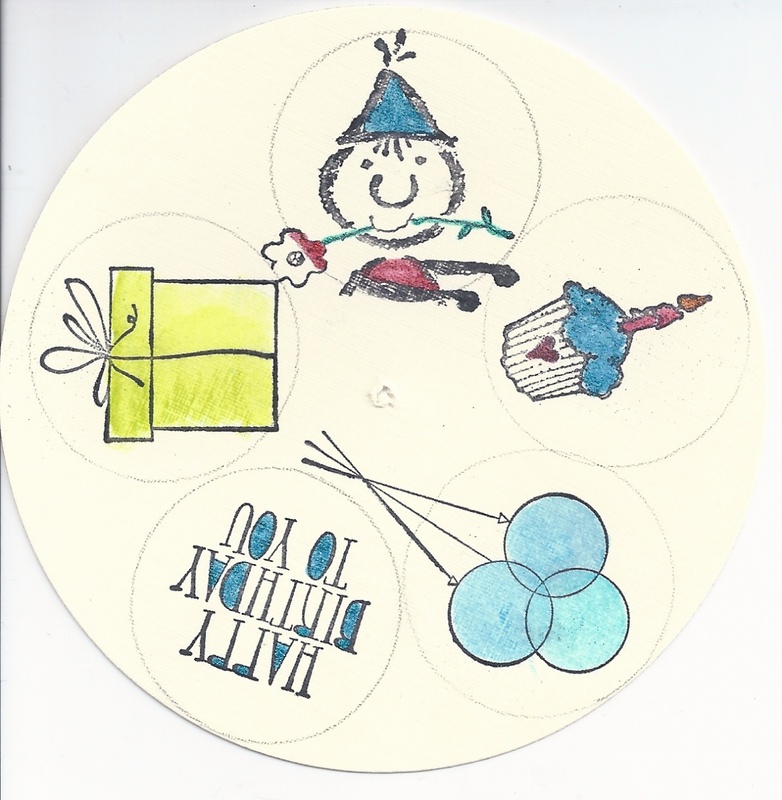 You will notice that on this last wheel I drew light pencil lines for where the wheel would stop so that I could stamp and then color the entire wheel before inserting in the card…I did have to make the whole for the brad and put the card on it so that I could see where the window would show up. I can either erase the pencil lines or I could make them darker like a shadow and leave them. Now I have to tell you that I did end up with bigger images on my wheels and while they fit inside the circle they do over lap a little as you roll the wheel and because I have more of my wheel showing in my thumb roll some of them show there also….but I have told you that I am not a 100% person so I don’t mind and next time I will fix it by looking for some smaller images and for moving the wheel down a little from the top of the card and making the thumb punch smaller and not having so much of the wheel showing in the thumb roll. HINT..OK I found that I was trying to put too much foam tape on the sides and top…bottom was fine… but the sides and the top you only need a little corner to make sure that your wheel will roll… twice Yeah I am obviously a slow learner…I had so much that when I stuck the card together I found that I had to gently pull it apart enough to free up the wheel and I had to cut off some of the foam tape. It was ok cause you don’t see the inside of the card… but BE WARNED…it only needs a little foam tape and before you peel it and stick it check to make sure your WHEEL WILL TURN EASILY…ok..
You will also notice that I didn’t put near as many embellishments on the front of the card as she did…so its up to you… Also if you don’t have the circle nestibilities then use your circle cutter and cut a 4″ circle… Remember that you don’t always need every thing they show you to create the card. They are in the business of selling product as well as showing you how to make something… HERE ARE SOME OF MY FRONTS. 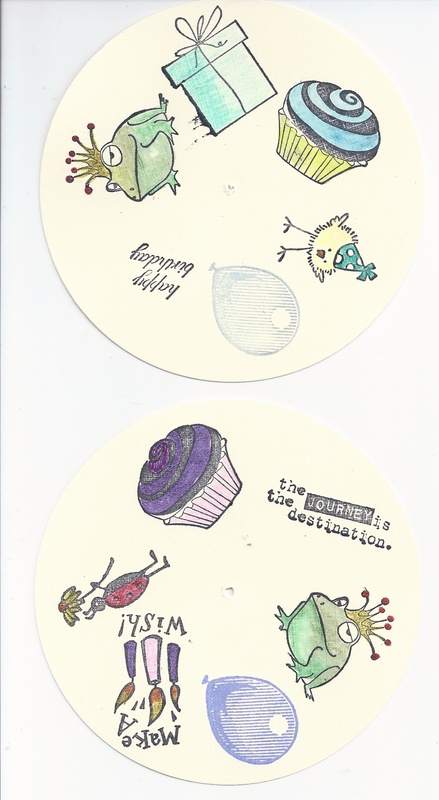 You will also notice that I used a few more brads that she did… and that some of my stamped images on the inside sorta show thru the thumb punch but I am not too worried about that but if it worries you you will have to maybe stamp a few less images…or stamp them smaller and closer to the left side of the circle. 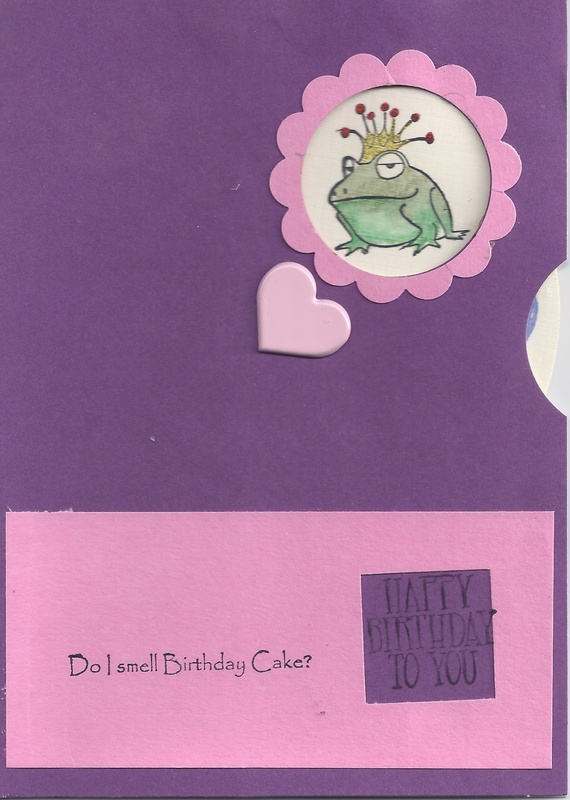 Ok I think that’s about it for today and I loved this card and making up some wheels ahead of time is great way to have them ready for an emergency Birthday or it could even be a Valentine card with assorted hearts and words… remember TAKE TIME TO PLAY…go MAKE SOMETHING TODAY. This guy is so amazing and when you think that it all goes away with the tide…you have appreciate is drive to CREATE…and he obviously enjoys his time at the beach. ANDRE AMBADOR’S BEACH ART check it out. 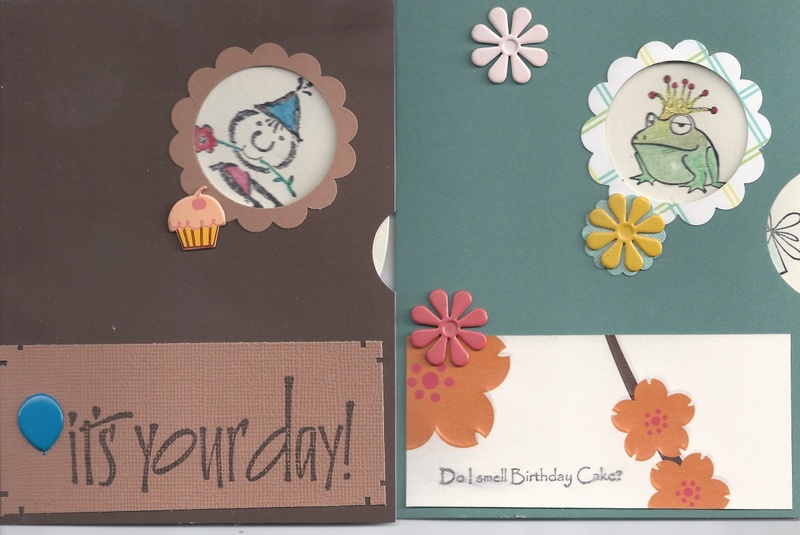 This entry was posted in Cards, Die cuts, Embellishments, Eye Candy by kath. Bookmark the permalink.